Passing along pointers to novice cigar smokers is one of our major goals at StogieGuys.com. So, with that in mind, here are a few more tips to help you enjoy this beloved hobby even more. No stubbing! Absolutely, positively, do not put your premium cigar out as you would a cigarette. It will release a mass of foul odors and unpleasant smoke. Always, repeat, always, let cigars die peacefully on their own. Premium cigars are pure tobacco and, unlike cigarettes or most machine-made cigars, will not burn on their own. Carrying a torch. Some torch lighters are incredibly hot, particularly multi-jet and tabletop models. Occasionally, I’ll fire one up and think I should be wearing a welder’s helmet. Ponder for a moment what all that heat is doing to the cigar. It’s burning it nearly like the surface of the sun. Now, there’s nothing wrong with torch lighters. Just be careful and use the farthest reaches of the flame to ignite your cigar. You just want to light it, not charbroil it. White ash. 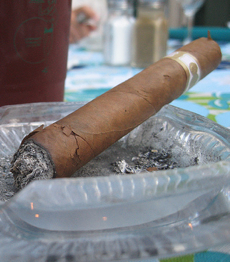 You’ll undoubtedly hear it said that a white ash is the sign of a good cigar. Well, tobacco people tell me that isn’t true. The color of the ash, they say, is mainly just a reflection of the minerals, salts, and chemical compounds absorbed by the tobacco from its soil. Some Cuban cigars, though by no means all, have very white ashes and that may be the origin of this belief. I see that the wraper is cracking on that cigar. Is that from improper storage? I have some of mine that have done that too and I was just wondering if that was natural or not. If not, how do I stop it? And a 4th cause: stubbing your cigar out instead of letting it die a dignified death. BTW, that looks like a LGC corona gorda to me. Do I win any prize for correctly identifying? Truth be told, that is just a stock photo. I picked it because it looks like someone stubbed it out and cracked the wrapper. Smoking in the f$#%ing freezing cold can crack the wrapper also – I tried smoking while shoveling snow yesterday. Yes, I think the heat from smoking, low temperatures with the general lack of humidity in cold air and the higher degree of humidity in the tobacco all clash and play havoc with the wrapper.